I think it can be safely said that in my many pleasant years of reviewing productions at the Crighton Theatre, I have never laughed harder than I did last Saturday night when doubled up in hysterics while enjoying Stage Right’s current offering of the Broadway musical hit, “THE ADDAMS FAMILY.” Let me first confess I was never among the many fans of the popular Addams Family newspaper cartoons of Charles Addams, upon which this musical comedy is based, or the later television show of the same name. With its book by Marshall Brickman & Rick Elice, and Music & Lyrics by Andrew Lippa, this delightful edition, produced by Carolyn & Steven Wong, is cleverly directed by Brenda Storseth. If it is true that comedy is the most difficult of the dramatic arts, that warning did not frighten Ms. Storseth or her talented cast, as they took the audience on an uproarious ride through the black humor of this very amusing show. That cast, by the way, includes one real Adam in the person of young Adam O’Connor, who plays the ancestral soldier, John Lee Addams. 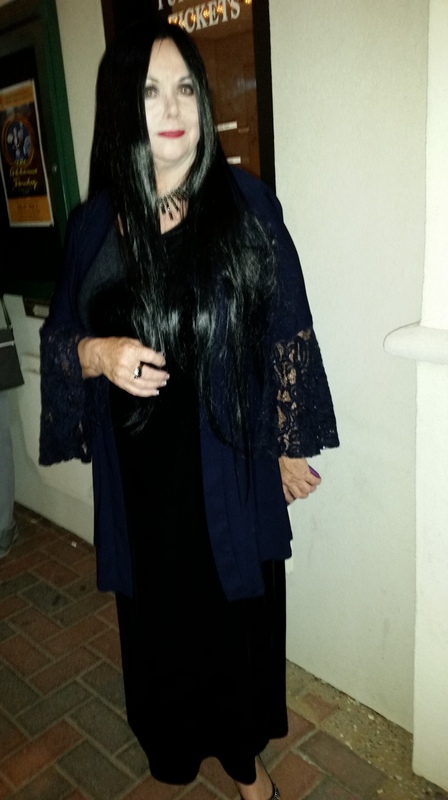 Audience member and Woodlands resident, Paulie McDade, came spookily dressed for the occasion. Theirs is a world that warmly embraces, “darkness, grief and unspeakable sorrow,” while knowing nothing of joy. The opening scene is a kind of weird gathering at the family cemetery where the ghostly ancestors come forth to join the living and frolic in the “intoxicating smell of the graveyard.” In a clever theatrical device, those ancestors become the talented singing and dancing ensemble that brings much of the fun to scene after scene. (Music Director, Layne Roberts, Choreographer & Make-up designer, Cricket Pepper). 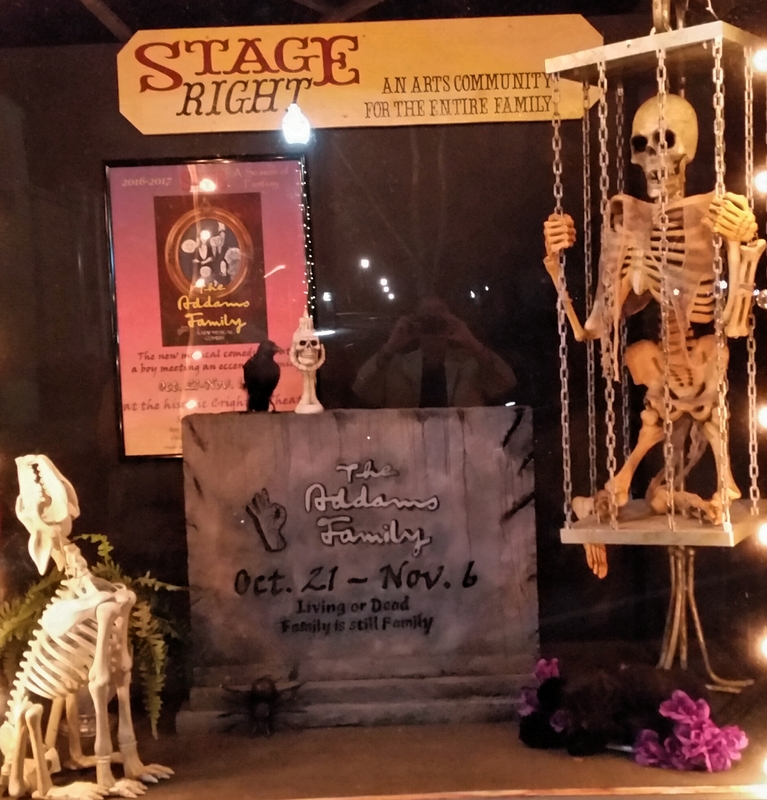 The spooky, varied and imaginative costumes (designer, Marieda Kilgore), and creative wigs from designer, Adam Isbell, all combine to bring a fun-filled atmosphere to the show in these weeks leading up to Halloween. But don’t be scared off! With skillful technical direction from Jim Bingham, ghostly aspects of the production (like eerie sounds and lighting) are all designed to amuse and not to frighten. And amuse they do, in this full-house theater that was often roaring with laughter. There were even a couple of timely jokes inserted to highlight this current Presidential election season. In the role of Uncle Fester, James Colburn gives a larger than life performance lighting up the stage for “Fester’s Manifesto,” as he enlists the ancestors’ aid during Wednesday’s troubling flirtation with the dreaded normal boy. Her loving father, Gomez, is much conflicted as Mr. Gilcrease sings the poignant, “Wednesday’s Growing Up.” Miss Preisler delivers one winner as Wednesday sings of her own conflicts about being “Pulled” in new directions by her love for Lucas, and yet another when she dreams of having just, “One Normal Night.” There is a delightful and decidedly Latin flavor to the musical score as seen early on when Gomez and Morticia duet for the song, “Trapped.” The audience begins to sense a romantic tango is on the horizon, and they will get it during the “Tango De Amor” in Act Two. In between we meet Lucas’ straight-laced parents, his mom, Alice (Cristy Campobella) and his father, Mal (Todd Brady), along with the Addams family’s nutty Grandma (Marilyn Moore) who joins young Mr. Hollyday for the merry speculations of the song, “What If.” Act One ends with the show-stopping spectacle of the mysterious game, “Full Disclosure,” in a twin staircase number that looked like it was plucked from the Ziegfeld Follies. Pretty Ms. Campobella delivered fun with the racy “striptease” of the concluding song, “Waiting,” though not every word of that high speed lyric could be clearly heard. Act Two delights include the black humor of Morticia’s reminder that death is “Just Around the Corner,” and a glittering, “The Moon and Me,” number that ends with a dazzling and not-to-be-missed laser show encompassing the entire auditorium. There is a tender “Happy Sad” duet from Gilcrease and Preisler, and still another when Miss Marshall joins Gilcrease for the sweetly romantic, “Live Before We Die.” That would be good advice for readers thinking of attending. Get your tickets now before they sell out! 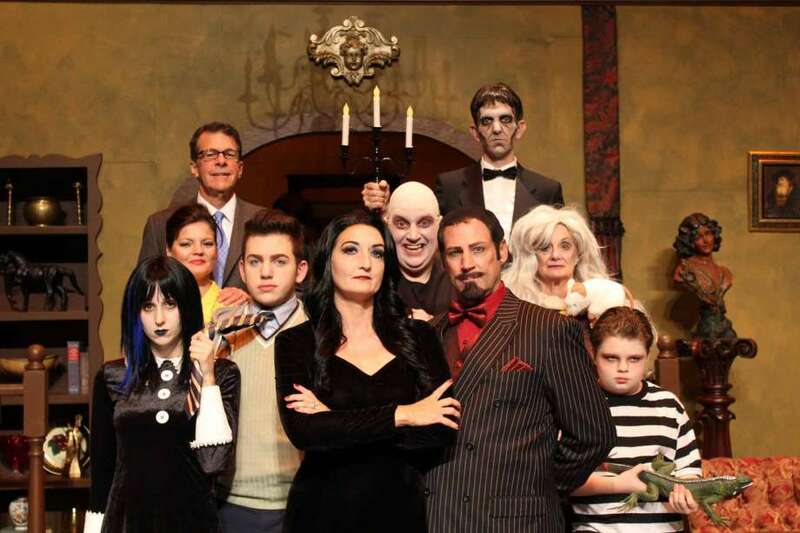 THE ADDAMS FAMILY continues through November 6th at the Crighton Theatre, 234 N. Main St. in Conroe, Texas, with performances Friday and Saturday nights at 8 p.m. and Sunday matinees at 2 p.m. For tickets and information call 936-441-7469, or visit the website at www.stage-right.org. This entry was posted in Addams Family, Broadway, BroadwayStars.com, The Courier Columns, ThePeoplesCritic.com, YourHoustonNews.com and tagged Addams Family, Conroe, Crighton Theatre, musicals, Stage Right Players. Bookmark the permalink.